Cumbria Tourism is working in partnership with Barrow & Furness MP John Woodcock to hold a special summit this month where tourism businesses across Furness will be urged to work closer together to showcase the opportunities on offer for visitors all year-round. The event on April 26 will welcome tourism industry officials from across Barrow and the Furness peninsula, as well as key figures who have played pivotal roles in the success of tourism elsewhere in Cumbria. Speakers at the event in Ulverston, include John Woodcock MP, Cumbria Tourism’s Managing Director Gill Haigh, Carl Bevan of Associated British Ports, Susannah Bleakley from the Morecambe Bay Partnership and Maddi Nicholson from Art Gene. They will also sit on a panel for open-floor discussions and a Q&A segment. ‘Break-out’ sessions will also be held in smaller groups, each led by a panel member. Gill Haigh, Managing Director of Cumbria Tourism, says, “Our most recent analysis confirms 3.1 million people visited Furness in 2017 and while that is an increase on visitor numbers from the year before, it is the smallest rise of all the Cumbrian districts. I strongly believe that increase isn’t representative of what Furness has to offer and is capable of achieving. The Furness Tourism Summit will be held on Friday 26th April between 10am and 1pm in the Williams Room at Ford Park at Ulverston. Places must be reserved by Thursday 18 April by emailing your interest to john.woodcock.mp@parliament.uk. We are on the look-out for three new Non-Executive Directors to help drive forward the county’s £2.9 billion tourism industry. There will also be a clear focus on the private sector, to best reflect Cumbria Tourism’s commercial aims and ambitions. Each newly appointed Non-Executive Director will hold office for a term of three years; they will then retire and be eligible for re-election for a maximum of 3 terms. Full details of each vacancy and the application process are available HERE. The closing date for applications is 12 noon on 6 June 2019 and the new Board members are expected to take up their roles ahead of Cumbria Tourism’s Annual General Meeting in June. Businesses from across Cumbria’s £2.9billion tourism sector are being asked to put forward their questions for a ‘Question Time’ style Brexit debate taking place at next week’s Lakes Hospitality Trade Show. The topical Brexit-theme panel will be one of the highlights of the event at the Junction 36 Rural Auction Centre on Wednesday 13 and Thursday 14 March. Just two weeks ahead of the planned departure date from the EU, it will be a chance for hospitality businesses to explore the specific effects of Brexit on the hospitality industry and discuss how business owners can take practical steps to maximise the positives and minimise the negatives. The audience will also hear from Copeland MP Trudy Harrison and Penrith and the Border MP Rory Stewart via pre-recorded video. Up to 100 spaces are available to pre-register to be part of the audience on the day. With a record 140+ businesses exhibiting at the 44th annual Lakes Hospitality Trade Show, a big turnout is expected across the two days. As well as the Brexit debate, well over 600 people have already signed up for a series of short workshops and seminars spanning everything from diversifying tourism businesses to tackling skills shortages and making the most of digital marketing. Attendance at the show, along with all seminars and workshops, is free. Places can be pre-booked. The first phase of a high-profile marketing campaign gets underway this week, aimed at supporting the tourism and hospitality businesses hardest hit by train disruption in recent months. Following robust and sustained lobbying at government level, Cumbria Tourism worked with Cumbria County Council and Transport for the North to secure £285,000 for a marketing campaign funded by the rail industry. In its role as the county’s official Destination Management Organisation, it is now launching part one of this high-impact campaign in the countdown to the main 2019 holiday season. The aim is to dispel perceptions that Cumbria is inaccessible by rail, as well as giving visitors practical ideas and inspiration to encourage them to book breaks away. It will support locations such as South Lakeland, Morecambe Bay and Cumbria’s West Coast, where businesses say they lost vital income during last summer’s train cancellations. Outdoor advertising at key transport hubs in Manchester, Glasgow, Edinburgh and London Euston will run alongside targeted online marketing on platforms including Facebook and Spotify. There will also be content in high-circulation newspaper titles such as the London Metro and Manchester Evening News, alongside a PR campaign targeting social media influencers. The activity will coincide with the launch of a new 25% discount off* selected off-peak Northern rail services in Cumbria. Cumbria Tourism’s Head of Marketing and Sales, Rachel Tyson, says, “It has been a challenging period for travellers and it’s important that we not only rebuild confidence in the rail services, but also positively inspire potential visitors about the range of possibilities on offer in the Lake District, Cumbria. A second wave of activity will launch later this year, to coincide with the main visitor season. A Cumbrian outdoor instructor has been named as one of ten finalists in a competition to find VisitEngland’s 2019 Tourism Superstar… and now he needs your vote! The annual award, supported by the Daily Mirror, recognises the passion and hard work of tourism industry workers who consistently go the extra mile to ensure their visitors have a truly unforgettable experience. The 2019 finalists have just been revealed with Cumbria’s own Tim Green named as one of the final ten. Tim, who lives in Keswick and is a director of Windermere-based CBA Events, is the only nominee in the North West to make the exclusive shortlist. 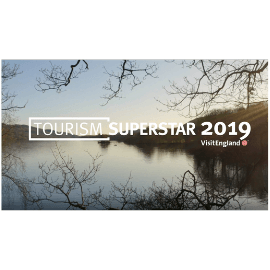 The overall winner will be announced during English Tourism Week (30th March – 7th April 2019) and will be invited to accept the coveted title at the VisitEngland Awards for Excellence. Tim, who joined CBA Events just three years ago, has been instrumental in spearheading a new phase for the company, persuading the owners of Windermere’s Graythwaite Estate to offer their grounds as a haven for highly personalised, tailored and unrushed outdoor pursuits. He certainly has a varied role, with his daily tasks ranging from instructing visitors on RIBs, canoes and stand-up paddleboards in the Lake District World Heritage Site, to arranging unique bespoke activity packages for a highly varied range of groups including corporate teambuilding sessions and stag and hen experiences. Known for his motto “I’ll sort it” and his seemingly limitless patience and energy, even when de-rigging a set at 3am after an action-packed day, Tim’s hard work has caught the attention of the VisitEngland judges but it’s now up to a public vote to find the overall national winner. The Daily Mirror is hosting an online public vote open until midnight on Tuesday 2nd April 2019 and Cumbria Tourism is urging people to support Tim to help both him and the county to receive as much exposure as possible. Supporters can vote online at on the Mirror website as well as helping to spread the word on social media using the hashtag #VoteCumbriaTim. The Family Business Network is the latest organisation to move into what is fast becoming a thriving hub of businesses at Cumbria Tourism’s headquarters. As well as being home to the county’s official Destination Management Organisation, the building in Staveley is already a permanent base for long-term tenants Land & Lakes and Lambert Smith Hampton. The Family Business Network now joins two other recent additions: wealth management business Raymond James and placemaking, destination marketing and business development specialist Tapir Ltd. There is also room for further expansion, with a newly converted 600 sq ft (56 sq m) office space currently available for lease and offering desk space for up to 10 people. The Family Business Network, founded by Sue Howorth, represents a large and growing community of family businesses, which began in Cumbria in 2014 and now covers Yorkshire, Lancashire and Lincolnshire. Founder of the Family Business Network Sue Howorth, add, “The move to a new office space within Cumbria Tourism has given us a rather exciting start to what promises to be a very busy new year for The Family Business Network. The location is perfect for us with its proximity to the M6 and a big advantage of the new premises is the ability to use the internal Conference room. Many of the businesses that we work alongside are already familiar with the building and it offers pleasant surroundings for hosting meetings and events”. Social media analytics reveal that #cumbriaday reached an estimated 16.5 million people on Twitter in less than 48 hours. Figures calculated by Cumbria Tourism confirm a spike of online activity centred around #cumbriaday. It coincided with the county’s six MPs inviting 15 Cumbrian businesses to showcase the very best of Cumbrian produce to Lords, MPs, parliamentary staff and even the speaker of the House of Commons, John Bercow, in the Palace of Westminster on Wednesday 23 January. Cumbria Tourism was one of the organisations at the event and to support the high-level celebration, the county’s official Destination Management Organisation threw its weight behind an online campaign to get #cumbriaday trending. From local residents and visitors, to people with family connections or anyone who simply admires the county from afar, Cumbria fans were encouraged to share their best images, anecdotes and fun local facts. In total around 4,000 online contributors generated almost 2,500 original tweets featuring #cumbriaday – reaching an estimated audience of 16,499,084 people in the Twittersphere between 22 and 24 January. Social media big hitters ranging from the Daily Mirror and BBC Breakfast to Virgin Trains and national tourism body VisitBritain were among those getting behind the popular hashtag. #CumbriaDay also featured in tweets in several foreign languages, including Spanish, Estonian, French, Swedish, Italian and even Indonesian. Managing Director of Cumbria Tourism, Gill Haigh, says, “Cumbria Day was a fantastic success, thanks to the great work of our six MPs and hardworking businesses from across the county. We had a brilliant day with them down at Westminster and have been overwhelmed by the response to our #cumbriaday social media takeover. “A massive thanks to every single person who liked, commented, shared pictures or retweeted. So many people got behind Cumbria Day and it really has helped spread Cumbrian pride far and wide. Cumbria is proving it’s the place to be once again, with the publication of an all-new guide dedicated to the county’s dog-friendly accommodation and attractions. 30,000 copies of the pocket-sized ‘Dogs Love Cumbria’ guide have been produced by Cumbria Tourism especially for people who don’t want their four-legged friends to miss out on their next holiday or day trip. More than a quarter* of households across the UK have a dog in the family, putting pet-friendly queries among the most frequent types of enquiry from potential visitors. Our latest campaign is expected to get tongues – and tails – wagging, with the best of what the county has to offer for dogs compiled in this single, handy guide. Waternook lakeside accommodation is one of the tourism businesses to feature in the guide. Owner Dominic Gordon says, “For us, our dogs form a vital part of the family. They’re loving, loyal to a fault, and bring so much happiness into our lives. We would never leave them at home when we holiday in the UK and I believe this is the same for the millions of loving dog owners around the country. The Lake District, Cumbria, is the perfect place to holiday year-round for all the family – especially for ‘man’s best friend’”. Responsible dog ownership is a key part of the guide, especially during lambing season, when dogs should be kept on leads. Owners are also urged to always make sure they clean up after their dogs in a responsible manner, so the county remains clean and safe for others to enjoy. You can download a copy of our ‘Dogs Love Cumbria’ guide on Cumbria Tourism’s official visitor website, GoLakes.